Anamorphic lenses allow a widescreen picture to fit in a normal frame without letterboxing. This is accomplished by optically squeezing the image horizontally. While technically unnecessary today, filmmakers continue to use anamorphic lenses for their cinematic aesthetic. Anamorphic images stay squeezed throughout the entire visual effects pipeline. For convenience they are displayed as unsqueezed in most software packages, but this is only superficial. 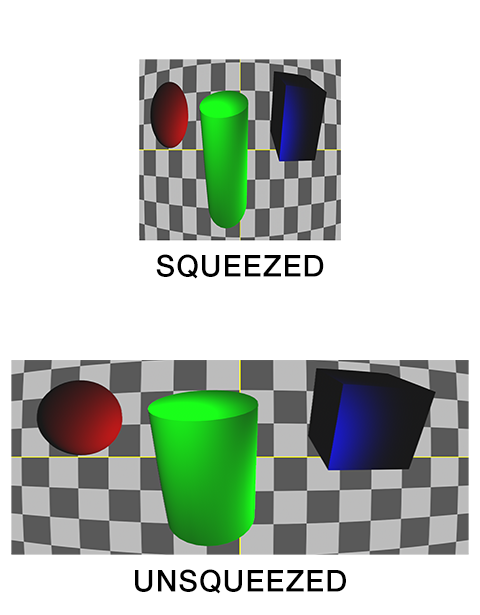 The squeezing is defined by the image’s pixel aspect ratio. The standard pixel aspect ratio is 1.0 (square). The most common anamorphic pixel aspect ratio is 2.0. For anamorphic shots the virtual camera’s film back width is multiplied by the pixel aspect ratio. This is usually around double, as in the case of CinemaScope (2.0). * Step 2 assumes a lens distortion grid was photographed or lens mapping data was acquired. Step 2 is often part of step 3. Camera tracking software can calculate lens distortion from most plates. ** Step 5 is required when undistorting barrel distortion. If overscan is not rendered the edges of the frame will be cropped when distortion is applied. This entry was posted in format, workflow on 2013-11-18 by admin.